The residential community at TMI consists of a diverse collection of students with varied backgrounds, ethnicities, nationalities, and spiritual beliefs. This diversity is celebrated not only in the boarding program, but across the entire TMI community. Most recently TMI has welcomed international students from Mexico, Haiti, Nigeria, Russia, China, South Korea, Saudi Arabia, and Singapore. The boarding community also welcomes students from across Texas and the United States. International students are encouraged to become involved in the numerous on-campus clubs, organizations, and athletic teams. Community involvement is critical in ensuring that our students’ boarding experience is fulfilling and meaningful. We invite international students to contact us with any questions they may have about one of Texas’ top college-preparatory boarding programs. The best way to learn about TMI is to visit the campus. TMI facilitates this by offering campus tours to international students and their families beginning November 1, 2018. Please contact the Office of Admissions at (210) 698-7171 or admissions@tmi-sa.org to schedule a tour. International students must have completed an application for admission by January 15, 2019. Applications submitted by this date receive first consideration for the 2019-2020 academic year. TMI has a rolling admission policy, as seats are available, after this deadline. All students seeking admission to TMI must complete an application for admission. Applications can be submitted online, printed from our website, or obtained by contacting the Office of Admissions. The priority deadline is January 15, 2019. TMI has a rolling admissions policy, as seats are available, after this deadline. Skype interviews are administered with international applicants who have completed the application process. The application process is considered complete when a student has submitted their application, test scores, transcripts, and recommendations. The Office of Admissions will contact applicants to schedule interviews. Do I need to submit an application prior to scheduling a campus visit/interview? Yes, all international students must submit an online application prior to scheduling a campus visit. We accept the TMI online boarding application, Standard Application Online (SAO), and the TABS application. How can I schedule a campus visit/interview? In order to schedule a campus visit, international students must submit an online application prior to their appointment. Campus visits can be requested via email or phone at admissions@tmi-sa.org, (210) 698-7171. What is the closest airport to TMI? San Antonio International Airport (SAT) is located 16 miles away from TMI’s campus. What are some local accommodations in the area? What is the minimum TOEFL and SSAT score requirement? A typical international student at TMI has an average TOEFL score of 85 and an average overall SSAT score of 2000. Does TMI offer an ESL program? Yes, international students are automatically enrolled in an ESL class. This class is designed to improve English proficiency and support students in learning the English language. Where do TMI graduates go to college? 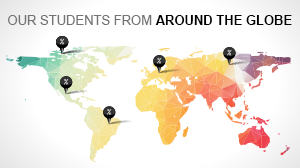 TMI graduates attend college across the globe. For a list of college acceptances, please click here. Chinese graduates of TMI have been accepted to a variety of prestigious universities including: Boston University, Drexel University, Fordham University, Northeastern University, Pennsylvania State University, Purdue University, Southern Methodist University, Texas A&M University, Texas Christian University, The Ohio State University, University of Texas at Austin, University of California, and the University of Southern California (partial list). Where are TMI boarding students from? The TMI boarding community celebrates diversity and has welcomed students from across the United States and Texas, Haiti, China, South Korea, Saudi Arabia, Mexico, Russia, Singapore, Nigeria, and more!